Five million people in the United States suffer from heart disease. Each year, the disease kills more than 300,000 Americans. Fortunately, the Center for Advanced Cardiac Therapy at the Montefiore Einstein Center for Heart and Vascular Care is leading the fight against the nation's fastest-growing killer. 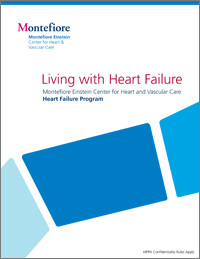 The Montefiore Einstein Heart and Vascular Center uses an integrated team approach to the treatment of advanced heart failure. Cardiologists and cardiothoracic surgeons collaborate within this state-of-the-art center, designed with the needs of the individual patient in mind. This unique multidisciplinary approach distinguishes Montefiore as a true center of excellence. The Montefiore Advanced Heart Failure program is one of only 15 in the U.S. that the American College of Cardiology has selected to participate in its Patient Navigator program. This program helps support a team of caregivers who assist patients during and after their hospital stays to ease recovery and reduce the risk of readmission—two factors that play a big part in patients’ long-term wellness. Our team of nationally recognized heart failure cardiologists has the experience and skills to administer the complex medical therapy now available to patients with advanced cardiac disease. Working closely with the team of heart failure nurse practitioners, they are able to educate patients and to provide the close follow-up required. In addition, patients may be evaluated for resynchronization therapy with a biventricular pacemaker or defibrillator implantation when indicated. Our active Clinical Trials Program plays a crucial part in the management of all patients referred to our center. We are able to offer participation in studies testing promising new therapies for patients with advanced heart disease. Some of these studies are conducted only at the Heart and Vascular Center. When appropriate, patients are evaluated by our team of world-class heart surgeons, who specialize in surgical therapies for heart failure, including coronary revascularization, valve surgery, ventricular remodeling and surgery to correct abnormal heart rhythms. When conventional medical and surgical therapy is no longer an option to treat the disease, patients may be evaluated for a ventricular assist device (VAD) or heart transplant. VADs are available both to support our heart transplant candidates until a donor is available, and as an alternative to heart transplantation, so-called destination therapy, in select patients. Our faculty members are recognized leaders in the field of heart transplantation and VADs, and our program is participating in several clinical trials testing new heart pumps. Cardiac Recovery: the potential for heart pumps to be used as a bridge to cardiac recovery. The pumps allow the heart to rest and heal with the assistance of novel drug and cell therapies. The Heart and Vascular Center's skilled team of cardiologists, cardiothoracic surgeons and expert nurses evaluates the patient and weighs the best course of care from a list of options, which includes the most current clinical research.